Enjoy a dip in our Pool. The Pool is part sun / part shade. Follow the boardwalk to our private crabbing pier. Our pier is located on Eel Creek. We are just minutes away from the Wild Ponies on Assateague. Looking south, down Eel Creek. Enjoy the serenity. Take a tour to the top of the Assateague Lighthouse, enjoy the view! The Inn is in the charming fishing village of Chincoteague, nestled among loblolly pines, but just a block off Maddox Boulevard (the "beach road"), which puts it close to shopping, restaurants, arcades, miniature golf, museums, and bike rentals - most within a block. 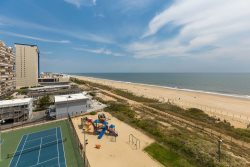 Consisting of 27 units, some rooms (6), some efficiency/suites (20), and an apartment, Assateague Inn is able to meet the needs of all, from lone travelers and family vacationers to family reunions, business gatherings, and romantic getaways. Our dock will be used from sunrise to sunset for crabbing, picnicking, sunset cocktails and just relaxing. Boaters will appreciate our ample parking for their trailers...and the pool by all who enjoy the water. We have lots of room for children to play. Come join us and relax on the beautiful grounds with Picnic Tables & Barbecues - hopefully you will be able to grill up the Fresh Catch of the Day! Leave the mainland behind. Come, enjoy the slower pace of our beautiful island. Walk our extensive beaches and trails, go bird watching, see the famous "Wild Ponies", and enjoy our friendly small town atmosphere. We're open year round.